Proper storage is fundamental. Cigars should be stored without cellophane in a humidor which has an adequate seal. It should be checked often to insure proper conditions (70% humidity). Contrary to popular belief, cigars should not be stored in a refrigerator or in a freezer. Either of these will affect the natural oils found in the leaf. Always take into consideration that air conditioning as well as heating will affect the humidity in your humidor. 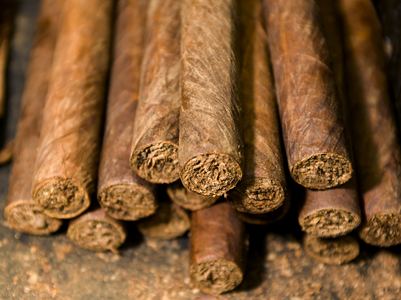 Cigar Aging is a complex process which requires special attention. While all cigars show some degree of maturity from additional aging, not all cigars age well. A common misconception is that a cigar which was rolled with “new” tobacco will lose its bite and harshness through humidor aging. No amount of humidor aging will mellow “new” or un-cured tobacco. We offer a variety of brand name and naked Bundled Cigars at low, affordable prices. We also carry many types of Cigar Cutters, Ashtrays & Humidors that are ideal for cigar smokers. And we have a large selection of Cigar Samplers that make the perfect gift for cigar smokers.